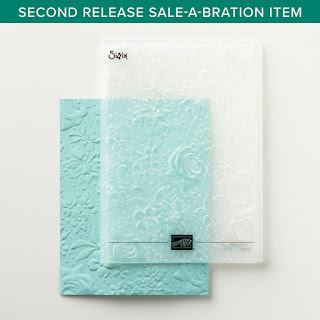 Today's Sale-A-Bration card features the Level One item, Country Floral Dynamic Textured Impressions Embossing Folder. I absolutely LOVE this folder! 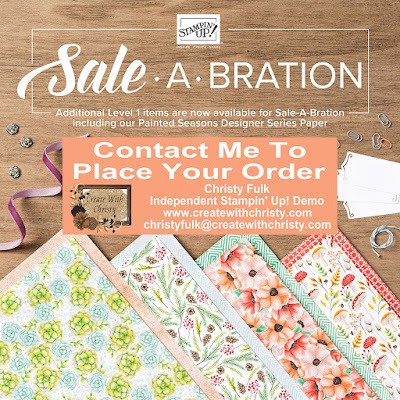 You can get it FREE if you place a $50 order (before shipping & tax) by March 31, 2019. I CASEd this card from a card that Chris Smith made. 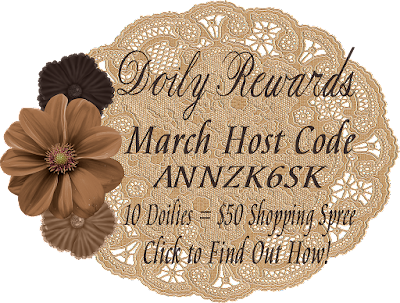 I made this card a few weeks ago, and the Wonderful Romance Bundle was still available. 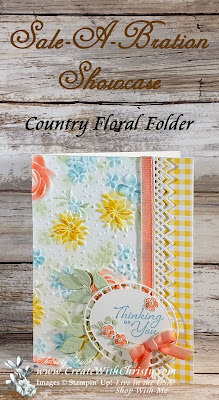 You can still get the Wonderful Romance Stamp Set, but the dies, Wonderful Floral Framelits, that were in the bundle have sold out. If you got this bundle, you can make this exact card. If you don't, you can definitely adapt it with another die-set and/or stamp set. Gingham Gala Designer Series Paper (DSP): 1" x 5-1/2"
With an 8-1/2" side along the top, score the Thick Whisper White piece at 4-1/4". Fold along the score line to form the card base. Attach the DSP piece to the right side of the card front. Emboss the largest Whisper White piece by running it through the Big Shot twice with the Country Floral Dynamic Textured Impressions Embossing Folder. Running it through twice makes the impressions even deeper. 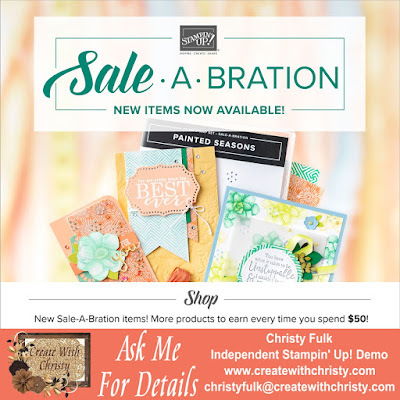 Using Sponge Daubers, sponge the raised images with ink from the following ink pads: Daffodil Delight, Balmy Blue, Grapefruit Grove, & Soft Sea Foam Classic Stampin' Pads. See picture for color placement. 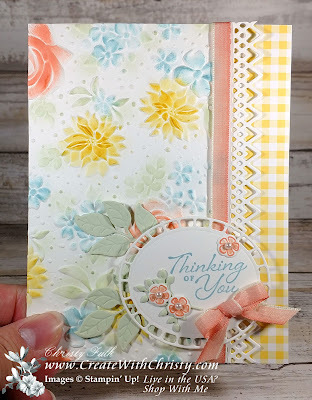 Die-cut the Whisper White border die-cut piece with the pointy border die from the Delicate Lace Edgelits Dies. Attach the straight edge of the border die-cut under the right edge of the embossed layer. Wrap the 7" ribbon strip around the edge of the embossed layer, and attach the ribbon ends to the back of it. Attach the whole thing to the left side of the card front. Stamp the small flower stamp from the Wonderful Romance Stamp Set three times onto the smallest Whisper White piece using the Grapefruit Grove ink pad. Color the flowers in with ink from the ink pad and a Blender Pen. Die-cut the flowers out with the coordinating flower dies from the Wonderful Floral Framelits Dies. Die-cut two leaf branches out with the larger leaf branch die and one leaf branch out with the smaller leaf branch die. Die-cut an oval out of the Whisper White oval piece with the oval die. 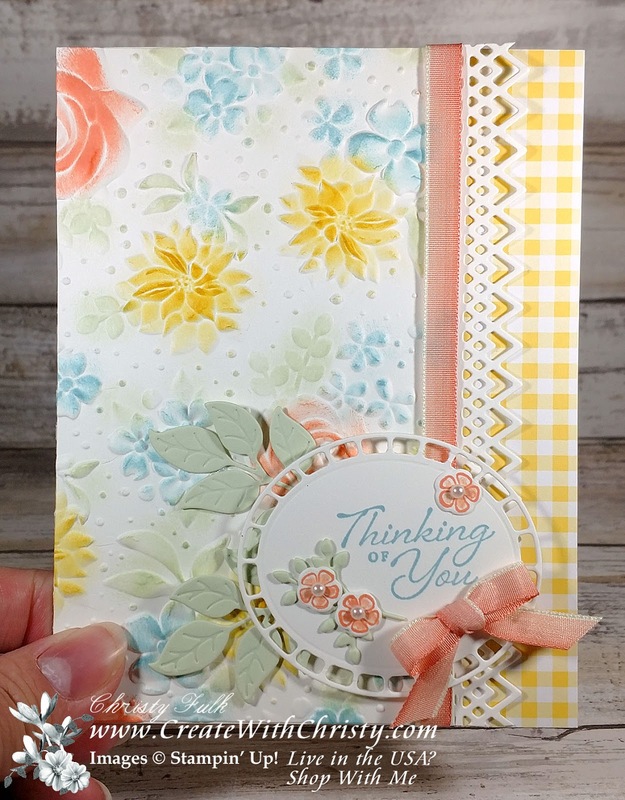 Stamp the "Thinking of You" stamp onto the upper-right of the oval using the Balmy Blue ink pad. 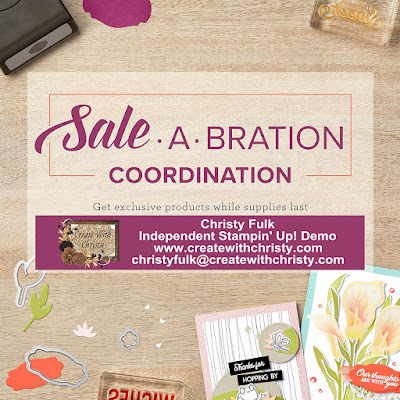 Attach the oval to the bottom, right of the card front using Stampin' Dimensionals. Attach the larger leaf branches to the left of the oval, tucking the bottom of the branches under the oval. Attach the the smaller leaf branch onto the lower left of the oval using Mini Glue Dots. Attach two of the flowers onto the smaller leaf branch using Mini Glue Dots. Attach the last flower to the top, right of the oval. Tie the 8" ribbon piece into a small bow, and attach it to the bottom, right of the oval using a Mini Glue Dot. Use SNAIL Adhesive when attaching, unless stated otherwise. 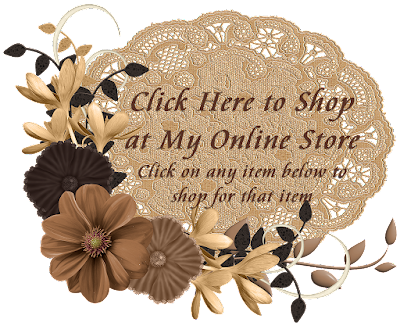 Note: The Wonderful Floral Framelits are no longer available to purchase. You could substitute with other dies and/or fussy cut.